You want the good news or the bad news first? The bad news? 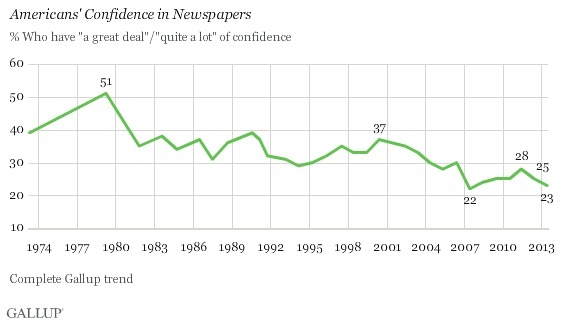 Okay: It seems only 23 percent of Americans have “a great deal” or “quite a lot” of confidence in newspapers, according to a Gallup poll. The good news? We’re not HMOs (19 percent), or organized labor for that matter (21 percent). Oh, wait. Also, liberals put more faith in newspapers than TV news, but for conservatives it’s the opposite. The head-scratcher? Public schools are in the middle of the pack at 29 percent. It’s those devious kindergarten teachers dragging them down. Here’s a pretty amazing video from the Colorado Springs Fire Department of a crew protecting a house from the Black Forest fire. Firefighters on the Structure Protection Strike Team stand like sentinels around the house deck as the fire crawls flashing slowly along the ground toward them. It might be time for labor unions to just hunker down and wait. “Wait for the workers to say they’ve had enough,” Yeselson advises. “When they demand in vast numbers collective solutions to their problems, seize upon that energy and institutionalize it.” The big question, of course, is what that moment of social upheaval might look like — or whether anything like the worker unrest in the 1930s is even possible today. It seems theme parks have become combatants in the class war. Theme parks have traditionally been the ultimate melting pots. Tourists, retirees, rowdy teenagers, families and fathers who would rather be golfing are all thrown together in an egalitarian experience in which the line for one is the line for all, and cotton candy is the food of the masses. Not anymore. It’s high time for “middle out” to replace “trickle down” as America’s economic model. And lastly, I wouldn’t bet against Warren Buffet. In the past, newspapers have done a lousy job of requiring customers to pay for digital content. The industry needs to do some recovery on that front, he said.